The Wolverines huddle up after completing a three-game sweep of Dayton on Saturday, March 16. With a field buried under multiple feet of snow, the Truckee baseball team’s practices to start the season have been held inside the school’s gym — or by arriving early to opponent’s diamonds for a precious few reps before taking the field for a game. The inability to practice outdoors, however, hasn’t prevented the defending Class 3A state champions from going on an offensive tear to open the season, which has included three-game sweeps of Fernley and Dayton. With 11 Wolverines back on the roster from last season’s title run, the team has hit the ground running. 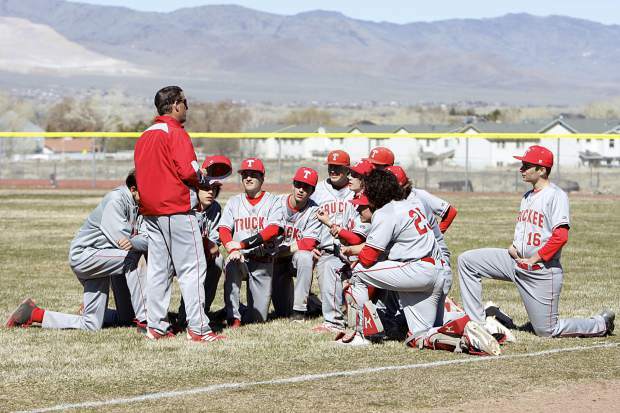 After sweeping Fernley to open the season, Truckee traveled to Dayton last weekend for a three-game series against the Dust Devils. After playing to a 3-3 tie through five innings in Friday’s series opener, Truckee sophomore Timmy Reeve led off the top of the sixth with a home run over the left-field fence. Junior Tyler Estabrook then singled to left field. A batter later, Estabrook scored on a ground ball to give Truckee a 5-3 edge. Senior Spencer Edmondson then hit a triple to right field. Senior Shane Poe would hit a single in the next at-bat to drive in Edmondson. Truckee allowed one run in the bottom of the seventh inning before getting the final out of the contest and a 6-4 victory. The teams met up again the following morning in Dayton for a doubleheader. The Wolverines put together a pair of dominant wins via the 10-run rule each time. Reeve and junior Deacon Mehler hit back-to-back home runs in the top of the sixth inning to give Truckee a 14-1 lead. Mehler then took the mound in the bottom of the frame and struck out the side for a complete game and a win via the 10-run rule. Mehler struck out eight batters, allowed one hit, and one earned run during six innings on the mound. From the plate, Mehler led Truckee with four RBIs. Senior Marcus Bellon drove in three runs and hit a triple during the game. Senior Derek LaFerriere hit a pair of doubles as well for the Wolverines. The teams returned to the field shortly after the first game concluded, and the Wolverines again jumped on the Dust Devils, taking a 15-1 win via the 10-run rule after five innings of play. LaFerriere drove in four runs during the game. Estabrook knocked in a trio of runs, and Edmondson hit a pair of doubles and drove in two runs. From the mound, Edmondson struck out five batters through three innings of work. Last year’s state championship team relied heavily on the pitching of three seniors. Going into this year, the rotation was an area of concern, but through six games, Murphy said he’s pleased with what he’s seen from the Truckee arms. Truckee will travel to face a struggling Sparks (0-6 Northern League) team for a three-game series beginning Friday. The team will then receive its first big test of the season the following week, playing a trio of games at Churchill County (6-0 Northern League). Going forward, Murphy said he doesn’t foresee the Wolverines playing or being able to practice at their home field until at least May. “We’re going to try to get down to Reno when we can. There’s a couple of places where we’re going to try to get outside, run around, get some fly balls. For the most part, with all the snow in Truckee, we’re stuck in that gym. There’s a slight possibility we could get out there, but that would be the first weekend in May the way it’s looking,” said Murphy.